1. Preheat the oven to 190°C, gas mark 5. Cook the cauliflower cheese according topack instructions. 2. Meanwhile, heat the oil in a large frying pan and fry the gammon for 6 minutes, turning once, until cooked through. Cook the beans in boiling water for 3-4 minutes and drain. 3. Place the gammon on a large baking tray and top with the beans. 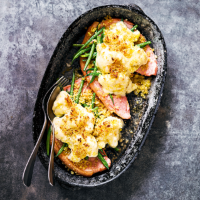 Spoon over the cauliflower cheese and sprinkle with breadcrumbs. Place under a preheated grill for 2-3 minutes until golden. This recipe was first published in Thu Oct 27 10:26:00 BST 2016.